Tonight we bottled our beer from our U-Brew Class–very excited to see how it turned out! I’ll have to share a post (although it will be all Instagram pictures) of our experience learning from Portland U-Brew in Sellwood. Still perfecting this whole “schedule” thing with my life. This recipe is seriously throwback though (so sorry about the blown out picture). 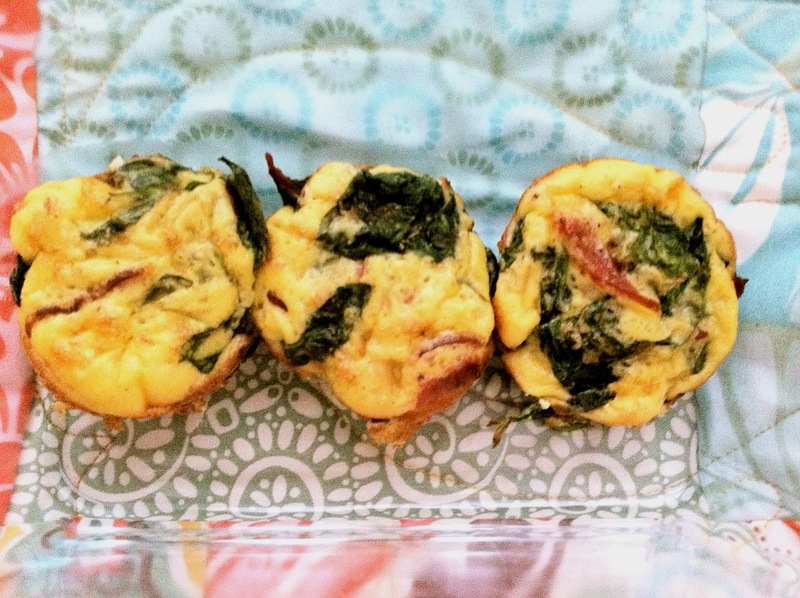 These mini frittatas were a staple when I was gluten AND dairy a year or so ago. I played with making these in muffin tins (what’s pictured below), ramekins and casserole dishes (obviously not minis then). Check out this super flexible recipe from ye olden blog times after the jump! Eggs every single day can get kind of…boring. Once you’ve had them fried, boiled, and scrambled–you should try them baked! These little frittatas (recipe from Wholefoodsmarket) are absolutely scrumptious, with or without the brie cheese that’s called for. Preheat your oven to 375°F. Oil a 12-cup muffin pan with coconut oil to prevent sticking. Heat a sauté pan over medium heat. Add bacon and cook until browned and crisp. Set aside on paper towels. Drain drippings from pan. Add onions and garlic to same pan. Cook 3 minutes over medium heat, until soft. Add spinach. Cook 2 minutes, until wilted. Add a little water if the pan is too dry. Crumble bacon and mix in with spinach. Set aside. In a separate bowl, whisk eggs and whites with milk, baking powder, salt and pepper. Stir in spinach mixture and cheese. Divide egg mixture evenly between muffin cups. Bake 20 to 25 minutes, until golden brown and firm to the touch. Other lovely add-on possibilities include: jalapeños, poblano peppers, french sorrel, mushrooms, and others! Jason and I LOVE to brew our own beer – I’m looking forward to hearing about your experience with U-brew! So impressed you brewed your own beer! Would love to try sometime but am intimidated by all the equipment you need. I guess that’s why attending a class would be great! Hope it turns out awesome! I love baking things in muffin tins! I sometimes bake frittatas in my heart shaped whoopie pie tin and they turn out super duper cute! Meatloaf in muffin tins is awesome too! Can’t wait to run and eat food with you again once I am back on the West Side! I’ve been looking for new breakfast ideas! I’m going to have to try this! I also can’t wait to hear about your brewing adventures and how it turned out!